M9 Chemical Agent Detection Paper is used to identify the presence of liquid chemical agent aerosols. It is designed to detect nerve (V- and G- types) and mustard (H, HD, HN, and HT) agents. M9 Paper is actually a coated tape with a mylar-adhesive backing so it can be afixed to objects. It is packaged in a dispenser with a serrated edge to easily tear off sections for use. M9 Paper is available in a single roll or by the case. There are 50 rolls in each case. M9 Paper contains a suspension of an agent-sensitive red indicator dye on the paper. The dye will turn pink, red, reddish-brown, or red-purple when exposed to a liquid agent. M9 Paper can detect agents, but not identify which agents are present. The tape that makes up M9 is 9.1 meters long and 5.1 centimeters wide. 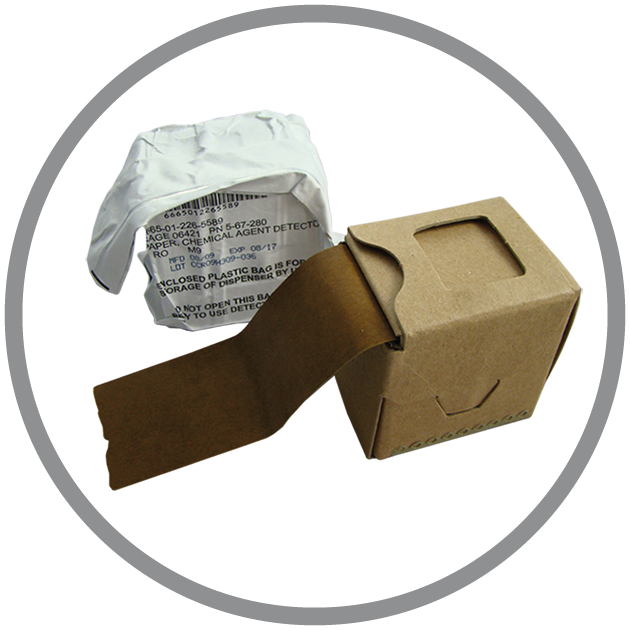 The self-adhesive paper attaches to most surfaces, and a moisture proof resealable bag is provided to store the dispenser after removal from its original packaging. Protective gloves must be worn when using this product. In 2012, the State of California’s FIRESCOPE Standardized Equipment List, listed the M9 as a required item for emergency and Hazmat first responders. © 2018 Luxfer Magtech. All Rights Reserved.